Disney’s Yacht and Beach Club Resorts are sister resorts in walking distance from Epcot and Disney’s Boardwalk. They feature Stormalong Bay, one of the most impressive pool complexes in the whole of the WALT DISNEY WORLD Resort – it’s a real highlight with waterslides and whirlpools as well as a large main pool. We love the range of things to do – it really helps to keep your holiday feeling fresh after a few days at the theme parks. There are tennis courts, a health club and the opportunity to rent boats and take them out onto the lake. For some old fashioned family fun, there’s a great miniature golf course nearby. Top Tip: At Disney’s Yacht & Beach Club Resorts why not make the most of a Disney Dining Plan, but don’t forget your Disney tickets. A Disney Deluxe Resort located in the Epcot resort area. This fabulous hotel is located in Walt Disney World's Epcot area. Take advantage of the complimentary transport to all the theme parks and spend your days having lots of family friendly fun. Disney's Yacht Club Resort is currently undergoing refurbishments. Room Refurbishments: Oct 29 2016 - Jun 23 2017 During this time, Guests may see or hear work in progress and certain pathways may be unavailable. To minimise any disruptions Disney will attempt to limit work to 9am - 5pm. Captain's Grill Restaurant - Mid May 2017 - 30 Sep 2017 During refurbishments the Captain's Grille is relocating to the oceanic themed Ariel's Restaurant. Yacht & Beach Club Convention Center: Aug 4 2016 - Feb 01 2018 Expansion Work; During this time, Guests may see or hear work in progress and certain pathways may be unavailable. To minimise any disruptions, Disney will attempt to limit work to 9am - 9pm. Prices correct as at 6pm on 23 Apr 2019. Please call for final price. Prices are per person based on 2 adults & 2 children sharing. Other durations available - call for quote. Prices include flight and accommodation as stated below and transfers on Disney's Magical Express, this is available from Orlando International Airport only. For more car hire and transfer options please ask your travel expert. For the purposes of the prices above, children are assumed aged 11 and under. Teen prices also available. Pre-register now for FREE DISNEY DINNING! Book your 2020 Disney holiday before 2 Jul 19 and everyone in your party receives FREE Disney Dining Plan. PLUS receive Disney's 14-day Ultimate Ticket for the price of 7 days Get ahead of the queue and pre-register your interest today. Bookings open 25th April 2019. This deluxe tropical retreat is still close to the Disney action with the convenience of a regular free shuttle to all the Disney parks. Soak up the atmosphere by lazing on the beaches or sampling the food in the popular ‘Ohana restaurant. In the heart of the Walt Disney World® Resort, the award-winning Walt Disney World Swan is your gateway to Central Florida’s greatest theme parks and attractions. 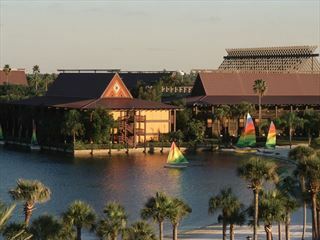 The resort is located in between Epcot® and Disney's Hollywood Studios. This stylish resort boasts good looking villas inspired by the shoreline homes of the Florida Keys. They are perfect for a stunning break with your family incorporating a self-catered experience.